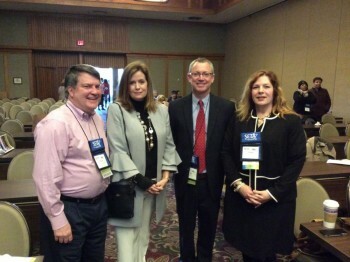 With the backdrop of the Smokey Mountains, over 700 workforce professionals from all over the Southeast descended on Asheville, North Carolina for the 2019 joint Southeastern Employment & Training Association (SETA) and the North Carolina Employment & Training Association (NCETA) conference on March 3-6, 2019. The three-day conference was held at the historic Omni Grove Park Inn and featured dynamic keynote speakers, engaging workshops, and networking opportunities for participants. Centralina Workforce Development Board Executive Director David Hollars and WDB NextGen Specialist Solomon McAuley each served on panels and lead workshops during the conference. On March 6, Hollars served on the “Partnering for Business Sake” panel which highlighted how North Carolina maximizes business service delivery. The panel experts included Dr. Jenni Harris and Michelle Muir who brought to light innovative efforts designed to enhance the local, regional and state delivery of workforce resources for employers in today’s challenging recruitment environment. “We believe in sharing the great ideas that are developed in the Centralina WDB region with others to help them solve their talent development issues,” said Hollars. Later that day, Hollars showcased the North Carolina Manufacturing Institute (NCMI) in the “NCMI-Building a World Class Workshop for Regional Manufacturers” workshop. Hollars shared the story of NCMI, the benefit of partnering with the Institute and its link and leverage with the existing assets of Rowan, Cabarrus, and Iredell counties to solve a growing gap between regional job seekers and available positions. He also highlighted its innovative funding and operational structure which allows the Institute to deliver results in response to a rapidly-growing need for manufacturing employees with certified skills and verified work readiness. 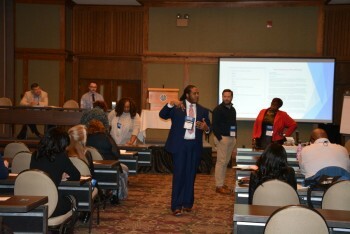 It was a busy day for McAuley as well as he, along with Ronne Grantham, Joseph Shepherd and Jeff Emory, he led the “Connecting Foster Youth to Employment” workshop. The workshop focused on the untapped population of youth aging out of foster care. The group introduced attendees to the collaborative partnership in Lincoln and Gaston counties working to engage this underserved population, generate awareness of available careers, prepare them through education and training opportunities, make a connection to local employers, and address transportation barriers. The partners also shared lessons learned during the early stages of this initiative. “Presenting at the conference started a great dialogue about the youth that are in foster care and how we can provide more support to them during their transition out of foster care and into the world. This has been such a great collaboration as well with Gaston and Lincoln County,” said McAuley. For more information on the Foster Care Initiative, contact Veronica Grantham at veronica.grantham@nccommerce.com or 828-755-8219. To learn more about Centralina Workforce Development Board staff, visit www.centralinaworks.com/directory-staff.